If you decide to sell your home without a real estate agent, it’s a good idea to use a DIY real estate sales platform to help you. Sites such as Purplebricks, BuyMyPlace (BMP), Property Now, and ForSaleBuyOwner (FSBO), to name a few, promise to save vendors thousands in agent fees and commissions, though the features of each offering differ — as does price – and you’ll have to be prepared to do some of the work yourself. Selling without a sales agent, makes your conveyancer or solicitor even more vital as they’ll be the primary person helping you through the process. Not all conveyancers are used to dealing with vendors selling their home without an agent, so it’s important to choose yours wisely — and advise them upfront that you’re forgoing the use of a selling agent to help. While Purplebricks and FSBO don’t offer any conveyancing services, BMP acquired MyPlace Conveyancing, an online fixed-fee conveyancing service, last year to complement its DIY sales service and help vendors with contract preparation, title searches, and so on. It’s important to know that you need to compile the contract for sale (in NSW) before you promote your property for sale. Learn more at the official NSW State Government Site regarding sales contracts. 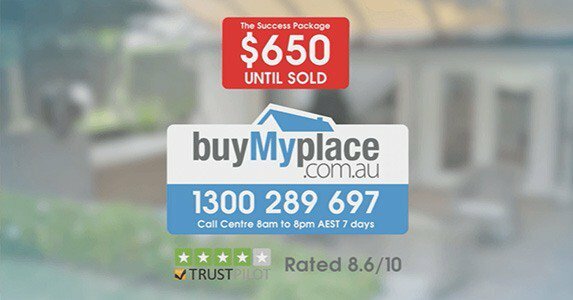 BuyMyPlace and Purplebricks are Australia’s leading DIY sales services. Besides offering straightforward marketing and advertising help with their basic sales packages, both services also offer premium packages to help you sell your property at auction or get help from a licensed real estate agent. They both also offer their own proprietary software to help you communicate quicker and more efficiently with buyers. BuyMyPlace has also partnered with financial services firm FlexiGroup to offer finance options that can be used to prepare the home for sale, moving costs or other expenses related to selling the home. While all DIY sales services promise to save you thousands in agents fees, it’s important that you consider the additional services you may want — auction, conveyancer, sales agent help — and select the service accordingly. Get all of the information about stages in selling your home with our free education guide!